Where good Americans go when they die. Paris, the capital of France. With All Due Respect to Shattrath City, this is the original City of Light. In its administrative area (the 75 postal area, split up into twenty numbered administrative districts called "arrondissements", although these sort of things exist all over France), also known as "downtown Paris", the population is only about 2 million, but the total urban sprawl has a population of over 12.5 million (making it the largest urban area in The European Union and the second-largest in Europe, after Moscow) and represents 18% of the French population. The region roughly in a 50 km radius around Paris is known as Ile-de-France, and its inhabitants are called "Franciliens" - although French people tend to refer to them all as Parisians. It has four ring roads (London only has two), the inner most being the division between the main city and the very poor suburbs... Or the very rich: the GDP per capita of the "Hauts-de-Seine" (the rich suburbs to the North West of Paris) is close to the GDP per capita of the district of Columbia, while the GDP per Capita of some parts of the "Seine-Saint-Denis" (the poorer eastern suburbs) is closer to that of parts of eastern Europe. This is a very old distinction; western Paris has been home to its better-off inhabitants for generations (as any account of the 1789, 1830, and 1848 revolutions can tell you). Still, you can go from the posher parts of the city to the poorer ones in 40 minutes by the subway. 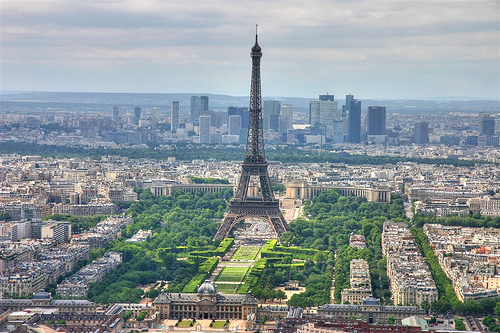 Paris is most famous for its wide boulevards, copied in several other cities around the world. There's of course the Eiffel Tower, originally intended as the entrance arch for the 1889 World's Fair and holding the "tallest building in the world" title until the Chrysler Building took it in 1930. The Louvre, the biggest and most famous art museum in France. La Cathédrale de Notre-Dame de Paris, known simply as "Notre-Dame" — a massive French Gothic cathedral on the Île de la Cité in the centre of Paris. A devastating fire in April 2019 destroyed most of the roof and caused the famous spire to collapse, but somehow the main towers and, more remarkably, the stained-glass rose windows survived, as did most of the artwork inside. Also notable for being the subject of Victor Hugo's famous novel The Hunchback of Notre Dame. The Sacré-Coeur basilica, atop the butte Montmartre. Built as a form of penance after the 1870 defeat against Prussia and as an homage to the Paris Commune , the basilica is still used as a place of pilgrimage for Catholics, but the 130+ meters climb make if hard to access (or take the funicular or the subway elevators if you feel lazy). The above-mentioned butte Montmartre. A hotbed of artists in the 19th century (mostly painters), the hill is today more known for being used in several movies and as a nightlife area, with several cabarets. It's also the only place where you can find a vineyard in Paris. Pigalle, the infamous Red Light District, host to anything not for the prude of heart, including the Moulin Rouge, as well as a lot of retailers of musical instruments. The Bibliothèque Nationale, both the historical (Richelieu site) and the recent (Francois Mitterand site) buildings, host to both all that is published in France as well as historical records. Le Marais ("The Marsh"), a historical district that was once host to the Chinese and Jewish communities of Paris. It's now more oriented towards fashion and hipster as well as LGBT culture and lifestyle. The Hotel des Invalides. Formerly a hospital and retirement home for Louis XIV 's veterans, it's now home to several museums. The Dôme des Invalides, formerly the royal chapel, hosts the grave of several war heroes of France, including some Corsican guy with a bicorne. The Père Lachaise, a gigantic cemetery full of famous people like Fryderyk Chopin, Édith Piaf or Jim Morrison. Famous cabarets such as the aforementioned Moulin Rouge, the Crazy Horse or the Lido. The city was pretty much untouched by the two world wars — the Germans only got into shelling range of the suburbs in the first, Paris surrendered in 1940 to avoid its destruction, the German commander surrendered it in 1944 against Hitler's orders to destroy it if he couldn't defend it, and nobody wanted to bomb the place. Also famous about Paris is its incredible mass transit system, which includes the iconic Le Métropolitain as well as other lesser known but equally functional networks. note Unless you are in a wheelchair, in which case it isn't so incredible. Despite all of the above, Paris has been suffering some backlash in the recent years due to it's legendary traffic and dirt issues, dog droppings and cigarette butts being the main offenders. The city has however taken heed of the complaints and is working to improve the current state of the city by both transforming several streets and roundabouts into parks and footpaths, while at the same time promoting the use of public transit, walking and other alternative means of transportation (such as car-sharing or cycling) while clamping down on incivilities such as littering, taking a page or two out of Singapore's book on the matter. Of note is the future Grand Paris project, aiming to turn the City of Light into one of the major global cities by giving Paris and the border cities a common framework and internal organization, with talks of a fusion of the cities in the future. While absorbing chunks of or whole régions is only a long-term dream for now, the potential supercity would represent five times the actual area of Moscow. Yeah, it's that big. See Gay Paree for Paris as a trope in modern fiction, as opposed to the boring facts. Historically, Paris is the site of infamous massacres - the St. Bartholomew's Day Massacre (with 30,000 dead in three days), the events of the French Revolution (especially the September Massacres and the final months of the Reign of Terror when all executions were conducted in the capital), the Bloody Week of the Paris Commune (30,000 dead in a single week), the Protests in 1961 when the French Police led by Maurice Papon killed 400 Algerians and dumped their bodies in the Seine. These and other incidents are portrayed in works by Dumas, Dickens and in the case of the Algerian massacre, the Michael Haneke film Caché. During the Nazi Occupation, there was the famous Round Up of Vel d'Hiv where the French Police acting on Nazi Orders arrested 28,000 Jews (including children) and held them in an ice-skating rink before deporting them to the Camps. Only 400 survived. In the 21st Century of course, there were the terrorists' attack on the offices of the satirical newspaper Charlie Hebdo by religious extremists in January 2015. Then there was the November terrorist attacks that took place the same year by Islamic terrorists. And in between, an attempted attack on a Thalys train heading to Paris, immortalized in the film The 15:17 to Paris (with the American soldiers who foiled the attack playing themselves). More recently is the April 2019 fire that engulfed Notre Dame, causing immense damage to the building. Located on the Champs de Mars built by Gustav Eiffel (who also designed the Bridge Bar-Hakeim, featured in Inception and the interior structure of the Statue of Liberty), it is a triumph of ironwork and was intended by Eiffel to be a monument that is futuristic and modern, to contrast the Neoclassical and medieval structures of earlier eras. Gustave Eiffel: Not only the art of the modern engineer, but also the century of Industry and Science in which we are living, and for which the way was prepared by the great scientific movement of the eighteenth century and by the Revolution of 1789, to which this monument will be built as an expression of France's gratitude. The prominence of the tower in the city skyline annoyed earlier residents and visitors (famously author Guy de Maupassant who stated, jokingly, that his favorite restaurant was the one in the Tower since it meant he didn't have to see it). During the 30s, the Tower actually was rented out to brands for use as advertising space, famously Citroen. Then when the Vichy established themselves, they put a giant vanity plate marking V on the side of the lower arch. It began during The French Revolution. The Place Louis XV was renamed Place de la Revolution and a commemorative Equestrian Statue of the King was destroyed by the Revolutionaries. The place was later renamed Place de la Concorde and today has a massive Egyptian Obelisk from the Luxor Temple gifted by Egypt to France in 1833. Likewise the Bastille Prison was destroyed carefully over the first years of the Revolution. Relics of the stones were sold as souvenirs. The July Column honoring the July Revolution (who gathered at the former area of Bastille to evoke its memories) stands at its former sites, and surviving stones are placed in an underground train station. During dechristianization, Revolutionaries vandalised statues of Kings and Saints at Notre Dame de Paris and converted the altar of the Virgin Mary to worship the Cult of Reason, much of the Church as seen today comes from recreation and restoration efforts. The Temple, a fortress of The Knights Templar until The Purge that finished them for good, became the Prison and final home of Louis XVI during his trial. Napoleon, worried that it would become a sacred spot for royalists, had it destroyed on coming to power. Baron Georges Haussmann in his remaking of Paris destroyed several old medieval areas to make Paris a 19th Century capital. This was one reason why his replanning was resented by critics; they felt that he, working under Napoleon III, was trying to deprive Paris of its independent character. The wide boulevards he planned supposedly to be hard to barricade is one example of this. Much of the city as it exists today is a legacy of Haussmann rather than the city as it had existed before him. Nevertheless the Paris Commune showed that the city was far from pacified. During the Commune, when the Army was closing in, the Communards set fire on the Hotel de Ville (subsequently rebuilt) and burnt the Palais des Tuileries to the ground. In the 20th Century, the city survived World War II with little damage, with no air raids over the city's center and thanks to General Dietrich von Choltitz's refusal to execute an order of Adolf Hitler to destroy the city. During The '70s, President Georges Pompidou built a new cultural centre in Paris, known as the Centre Pompidou (designed as a modern art museum). To build it, he controversially ordered the destruction of Les Halles. This was the celebrated glass-windowed open-market celebrated in many French novels and films, the subject of philosopher Walter Benjamin's The Arcades Project, the destruction was widely resented and remains quite controversial to this day. It continued in April 2019, when the famed cathedral Notre Dame de Paris caught fire during renovations to the roofing. The interior, including the medieval rose windows, was fortunately spared, and most other pieces of art were saved or were undamaged by fire. However, the 19th-century spire collapsed, the debris puncturing the masonry below, and the majority of the wooden roof was destroyed. According to experts, it will likely take over a decade to restore the cathedral, although hundreds of millions were pledged to fund the reconstruction within less than 24 hours. Historically, French Kings often used any chance they could to get away from the city. King Philip le Bel faced a riot from angry Parisians and had to hide in the Temple Fortress (he would later win back his popularity by killing his former Templar benefactors). Poor King Louis XVI's ship was sunk the day the women of Paris led him from Versailles to Tuilleries. Even after the Revolution, there were instances of Republican governments trying to move the capital out of Paris, which the Girondins tried to do so only to lose their heads. The Third Republic operated from Versailles during the Paris Commune and even after the suppression was afraid of stepping in, with many arguing to shift the capital. Victor Hugo: "Ninety-three was the war of Europe against France, and of France against Paris. And what was the Revolution? It was the victory of France over Europe, and of Paris over France. Hence the immensity of that terrible moment?, '93, greater than all the rest of the century"
Shining City: It's often depicted as shining at night, and brightly colored during the day. Starving Artist: The city used to be a haven for them and still represented as such in fictional depictions.. Vincent van Gogh, the Impressionists, bad boy poets Francois Villon and Arthur Rimbaud, James Joyce and the Modernists, surrealists, jazz musicians, experimental film-makers across the world who, like Woody Allen notes, "thank God the French exist" as a market for their films. The reason it attracted them was that the rents were cheaper back then, the Louvre (and the Cinematheque) was open till late at night for their perusal, lots of sidewalk cafes and a good night life. Since the rise of neoliberalism in the 80s and 90s, Paris, like many world cities, has become quite expensive which many feel compromises the qualities that made it so great in the first place.